When I said I grew up on wild game… I wasn’t kidding. 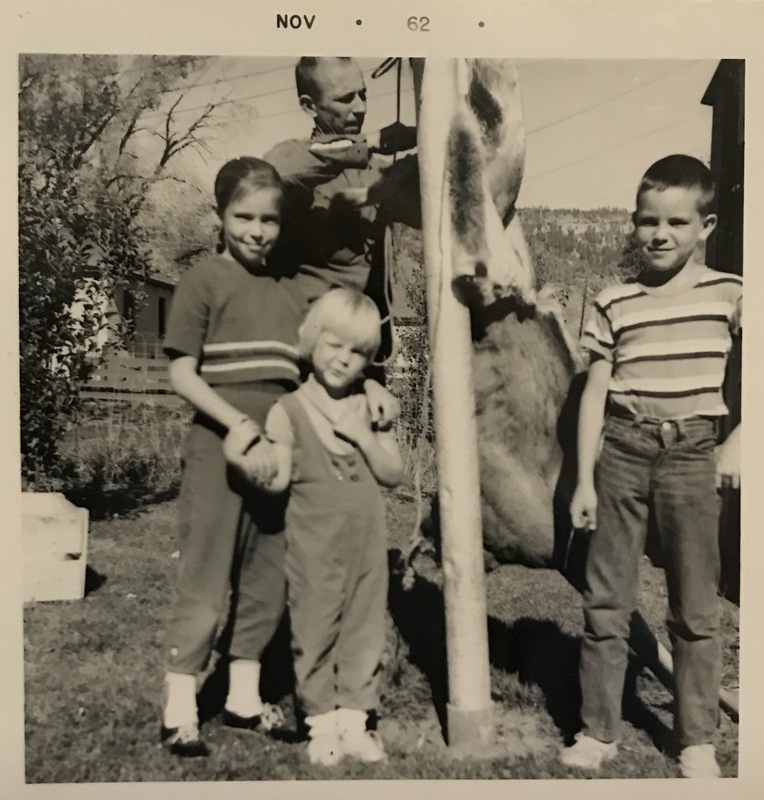 This is my dad skinning his deer in the back yard… strung up on mom’s clothesline pole! My older sister and brother are there… and that little blondie with the squished up face is me! For some weird juvenile period in my life, I thought squishing my face up like this in photos was neato. Or cool. Or whatever we said in 1962. I know ruining photos for a couple of years frustrated my mom… and, thankfully I outgrew that… but back then… it’s what I did! So cute! I have some dreadful pictures from childhood, but most of them take me back to time and place, so it’s fun. I love how you and your big sister are holding onto one another. My sisters and I have gone through many stages of love you/hate you over the years, as most siblings do, I’m sure. It’s fun to look at the body language in photos and this one is no exception! you looked like the sun was in your eyes, kinda cute, another great picture from the past!